As our EQ team was getting settled in, our UO team took on the task of growing AD into an even better player run city. 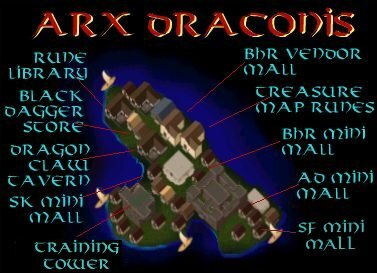 It has always been a public player run city with good vendors and a tavern, but now it was time to take the next step and make it even better and shape it into the premier city on Atlantic shard. 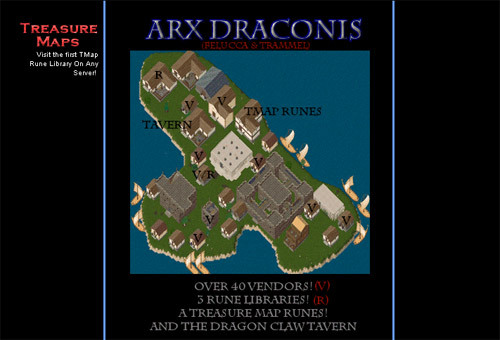 A revised website: The Arx Draconis webpage was given a complete face lift. New sections were added including a newspaper, a listing of places on the mainland where runes to AD can be obtained and much more. Standards on pricing and a webpage of vendors and prices: Standards were set for AD vendors and a published, public price list was put on the site. These represent the minimum prices (adjusted as market demand changes) we sell items for on AD. We also show were each vendor is and what you can get from them. An increase in the number of vendors on AD: We opened several new stores and increased the number of vendors. Reagents, for example, are very hot items so we tripled the number of those vendors to meet that need. You can find nearly any item (including rares and powerful magical ones) on AD now. The Treasure Map Rune Library: We started the very first Treasure Map Rune Library. Since then some others have tried to copy it but ours remains the most complete and is very widely used. The concept is simple. You decode your map and go to our website. Match the map to the site and you will see a number (like B7) where your treasure is located. Remember that number and go to the library on AD and recall off that rune. You are within 1 space of the treasure chest so dig and up it comes. General Rune Libraries: 2 general rune libraries were revised and updated to include runes to all major towns and shops, good mining spots, dungeons, shrines and even rare item spawn spots. Tavern Business Hours: The Dragons Claw tavern took on a large staff of bartenders and began to work regular hours and hold special events like ladies nights. Island Events: Large, shard wide, island events were begun. These invents included things like Craftsman nights and a massive, shard wide, Scavenger hunt. These continue to this day with 1-2 events each week.